The Adventures of Tintin Movie Review: Is Tintin Terrific? Much of the world is completely enamored with Tintin and his adventures. There is a big question mark that the European-born character could cross the Atlantic and become a huge movie star in The Adventures of Tintin. After witnessing Tintin on the big screen, the answer to that inquiry should be a resounding yes. With Steven Spielberg directing and Peter Jackson producing, the introduction of Tintin to U.S. audiences should be effortless. Tintin is a young reporter who lives in London and has become quite the celebrity solving the cases no one else can solve. Along with his trusty dog Snowy always at his side, on the pages of the Tintin series, adventure permeates. Spielberg’s Tintin has a strong Raiders of the Lost Ark feel and thus a project has found its perfect projector in the Dean of Film Adventure. The Adventures of Tintin surrounds the title character as one of his most challenging riddles arrives. After coming into possession of a model ship, he is warned trouble will follow. Sure enough, when he returns home after going out a little later, the ship is gone, his home is trashed… but one clue remains. Tintin is voiced by Jamie Bell (Billy Elliot) who reteams with his Defiance costar Daniel Craig, who portrays dual roles, Ivanovich Sakharine and the evil Red Rackham. Every good adventure should have a crisp hero-villain battle at its core that is often a fragile thing to achieve on film, especially when animation is involved and actors rarely share studio time. Craig and Bell are swift in their story collision course and each are only outdone by the Captain. 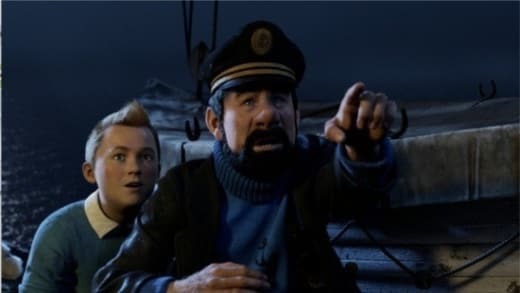 Andy Serkis, in dual roles as Captain Haddock and Sir Francis Haddock, does it again. His work with motion capture is under serious award consideration for Rise of the Planet of the Apes. In The Adventures of Tintin, Serkis explores new territory. His Captain character is boorish while still possessing huge heaps of compassion. The production of Tintin is mind-blowing. It is a visual marvel that Jackson and Spielberg have crafted. The audiences’ mind will constantly be asking: Is this real or is this animation? We’ve come a long way from the incredibly good for its time Polar Express, and more recently A Christmas Story. Tintin and his adventure’s sweeping action sequences speak to that immensely. When seamless animation is executed, motion capture or otherwise, thrills and suspense can interweave flawlessly and produce brilliance. What holds Tintin back is its pace. It feels long at 107 minutes. Spielberg, and this is why we love him, is from the old school of not employing the tightest cutting when it comes to long intros or exits. He is a visual filmmaker who never wants to leave out a thing of beauty. When the action of Tintin is cooking, the film sizzles. Yet, some of the interlude scenes lack luster. Overall, with a well-executed story, astonishingly gorgeous filmmaking, solid performances and a film that entertains, The Adventures of Tintin is a solid holiday film.